Sony has decided to stop making 3.5-inch floppy disks. That's it, put a fork in this format, it's done. Of course, the 3.5 inch floppy has been dead for quite some time. When was the last time you used one? Last year, while cleaning my basement, I came across some old 3.5 inch floppies. 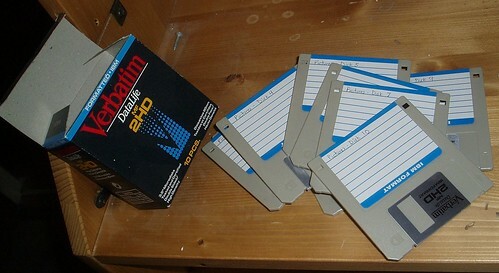 There was a time floppy disks held my entire digital photo collection and was the primary way to get Word and Excel docs from A to Z. My boyfriend and I are using some of his as coasters. They work wonderfully! I was about to say someone should recycle those into art. Coasters isn't bad.